It will be until mid-May when the US SEC decides on Bitwise Bitcoin ETF. Like the SolidX and VanEck application, this ETF is backed by Bitcoins secured by a third party custodian. 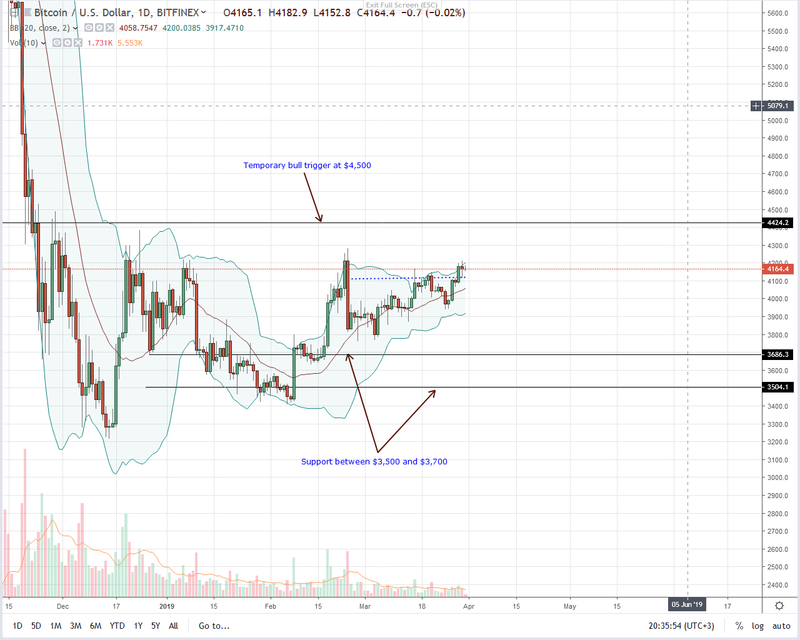 Meanwhile, Bitcoin (BTC) prices are stable inside Mar-29 high-low as bulls build momentum towards $4,500. For the second time, the US SEC is putting off their decision on whether Bitwise Bitcoin ETF application meets their requirement and ready for investors. By doing so, the asset management firm joins a long list of applicants including VanEck, SolidX, and CBoE a joint application which the community says stand a change of getting the green lights from the US regulator. Submitting their file in January, the San Francisco firm plans to roll out a physically backed ETF and after 45 days, the SEC was supposed to make their decision tomorrow. However, the regulator says their decision will be made public in mid-May. Bitwise Bitcoin ETF will track the performance of the world’s largest digital asset from the Bitwise Bitcoin Total Return Index. The index draws prices from trusted cryptocurrency exchanges. Differentiating itself, their Bitcoins will be stored in a cold wallet by an institutional grade third-party custodian for security and accountability purposes. Should the fund check all the requirements then the NYSE Arca shall list the ETF will Bitwise Index Services will be tasked with producing and servicing the world’s first Bitcoin ETF approved by the strict SEC. After weeks of lower lows, this week’s performance is encouraging. Not only will it close the week on a high, adding 2.3 percent but in line with our last BTC/USD trade plan, Bitcoin prices will for the first time closed above a five-month liquidation trend line. In a typical bullish breakout, such will encourage participation now that prices are stable above $4,000. Besides, bulls of Mar 5 are now live. This is because of Mar 27-29 upswings thrusting prices above Mar 16. As a result, our short-term longs are valid with targets at $4,500. Despite these encouraging gains, Feb 24 losses are conspicuous. Once there is a high volume break above $4,500 reversing this slide, risk-averse can trade can begin ramping up. Accompanying this break above should be high volumes exceeding recent averages of 6.5k, Mar 29—8k and preferably Feb 18—37k. Is CoinBase New Remittance Service a Subtle Advert for Ripple (XRP) and xRapid?